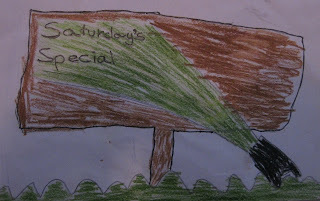 The Saturday Special is coming out on Sunday this week, IST, but it's still Saturday somewhere in the world. If you're new to the Green Light Dhaba, welcome! On the weekends, we usually just serve snacks; scroll down, or explore the left side of this page to read from our main menus. If you like what you see, don't forget: subscriptions are free, so there's no need to miss a single issue. Why not grab a feed or follow us? This is the last call for the homework I gave last week: write a letter to a child and send it here; I'll post it on the Dhaba sometime in the next week or so. Details at the end of this post. Learn about the Delhi Bus Rapid Transit System. An old post from Space Bar, looks at buses in a totally different way. Bhagwad on an economist who says poor people should die first. On a related matter, if you've ever applauded economists like Nicholas Stern who analyze whether global warming is "worth it," you should understand something more about their assumptions. Read this for a hard look at the question. It's not a pretty picture. Space Bar sent me this link about a mega project being considered in Europe. Is this the answer we've all been waiting for, or is it the biggest land grab since the Scramble for Africa? Or maybe we are just too fixated with technology? Study: Americans think green more than they do green. Last but not least: Nicolas Cage buys way to much stuff! Guest Post: What will we tell our children?